To coincide with International Women’s Day 2016, Survation, on behalf of the Fawcett Society, have released more findings from our 8,000 person poll on a variety of issues affecting women and men relating to childcare, employment and parental leave. The poll found that nearly half (46%) of people believe that a woman becomes less committed to her job once she’s had a baby, compared to just one in ten (11%) who believe a man becomes less committed. 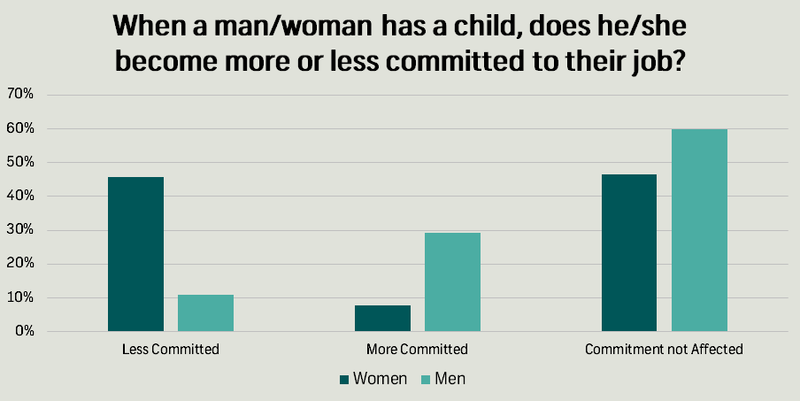 On the contrary, nearly three-in-ten (29%) people believe that a man becomes more committed to his job once he’s had a child, compared to just 8% for women. The survey also found stark differences between the amount of leave men and women take at the birth of their child; a majority of women (54%) take 6 months or more leave at the birth of their child, whilst the most commonly stated time length for men was just 6-14 days (43%). However, coupled with a third of men (33%) who only took 1-5 days leave, it means that three-quarters (75%) of men are taking two weeks or less. However, given that Shared Parental Leave has only recently been introduced, it is perhaps not surprising that women take substantially longer leave than men. However, it does appear that men could be beginning to take more entitled leave. Comparing parents whose youngest child is under 18 to those whose youngest child is over 18, the amount of leave taken by mums is broadly unchanged. There are no statistically significant differences between the amounts of leave taken by mums of children under and over 18. However, whilst the most commonly stated length of leave for dads of under 18s remains six to fourteen days (45%), there are some differences in the length of time taken for dads who had their youngest child more recently, with 18% of dads of under 18s taking 1-5 days compared to 33% of dads overall and 23% of dads of under 18s taking two to four weeks compared to 16% of dads overall. 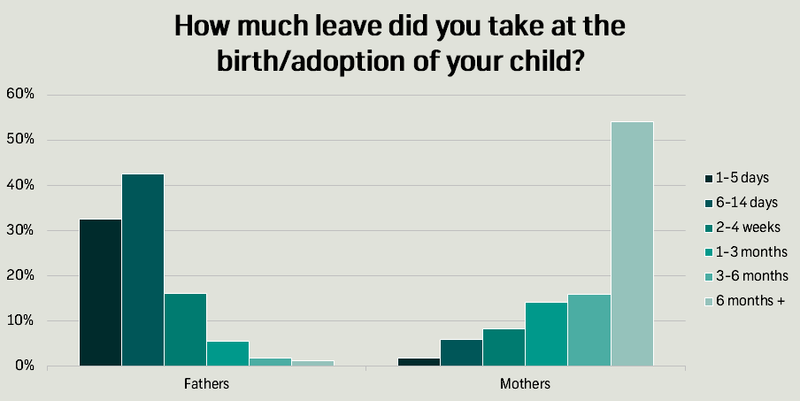 The survey also shows that it is not a lack of desire on a man’s part that prevents him from taking longer parental leave; 41% of fathers said that they did not get enough leave at the birth/adoption of their child, whilst two in five admitted to lying to their bosses occasionally or often in order to take time off to spend with their children, compared to just 28% of mums. Over a third (35%) of dads in employment say that men who take time off to care for children are not supported at work. Finally, the survey also tested the perception gap between mums and dads regarding which parent was carrying out tasks associated with the care of children. The results indicated that women are still doing the bulk of these tasks, but the perception gap between men and women was very different. Men were almost twice as likely as women to think that tasks, such as taking time off when children are ill, taking children to the dentist, arranging play-dates and washing children’s clothes, are equally shared. 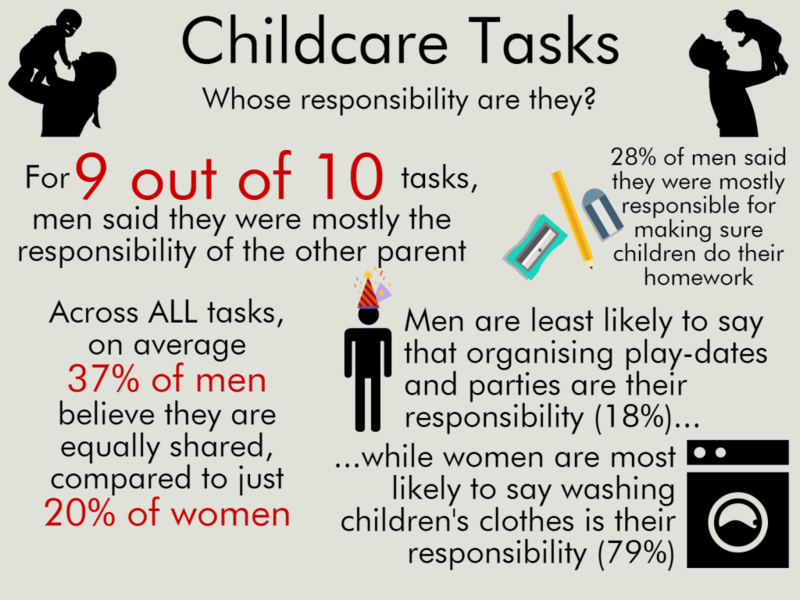 For 9 out of the 10 tasks we asked about, men said they are mostly the responsibility of their child’s other parent. Men are most likely to say that they are mostly responsible for making sure children do their homework. 28% of men say this mostly their responsibility and 21% said it is mostly the responsibility of their child’s other parent. A majority of Women disagree with this assertion. As 60% said making sure children do their homework is mostly their responsibility. Women are most likely to say that washing the children’s clothes is mostly their responsibility. 79% of women say this, more than ten times as many as those who say it is mostly their child’s other parent (7%). Only 13% of women say it is shared equally. Across all tasks on average 37% of men said that they were equally shared while just 20% of women said the same. Survation polled 8,165 UK residents aged 18+ between 30th November and 3rd December 2015. Full tables are available for the overall sample are available here, and split out for men and women here and here respectively.